The first quarter saw an annual expansion rate of just 0.6% as workforce problems persisted, but a pickup in growth is forecast for all of 2018. After a dramatic swing last year, Maine’s economy started 2018 on a sluggish note, posting one of the slowest state growth rates in the country. The federal Bureau of Economic Analysis reported this week that the state’s economy grew at an annual rate of just 0.6 percent in the first three months of this year, 46th in the nation. Last year, the state’s gross domestic product – the measure of the output of goods and services in Maine – grew 1.4 percent, below the national growth rate of 2.1 percent and the New England regional growth rate of 1.6 percent. But the economy swung wildly last year, from a 2.8 contraction during the April-June quarter to 6.8 percent growth in the following three months. TD Bank forecasts that economic growth in Maine will pick up for the rest of the year and end up by 1.8 percent. But that’s well below the 3 percent growth rate forecast for the rest of the country in 2018, said James Marple, a senior economist for the bank. Marple said Maine’s persistent economic problems – an aging population, negligible population growth and a tight labor force – aren’t expected to change anytime soon. He also said possible trade wars with Europe, Canada and China – a wild card that wasn’t factored into the forecast – is likely to produce more drag on the state’s economy. An analysis by the U.S. Chamber of Commerce released this week found that $130 million in Maine exports are threatened by retaliatory tariffs by other countries, which would hurt sales of those products overseas. That impact comes almost exclusively from two countries – $67 million in Maine exports to Canada and $59 million in Maine exports to China, the chamber’s analysis said. A seeming bright spot in the Maine economy – an unemployment rate of just 2.9 percent in June – actually could come to represent another drag on the state’s growth, economists warn. With so few people looking for work, Maine businesses are unlikely to expand because of the difficulty, and likely greater expense, of finding employees. “It’s either do things with fewer employees or wage growth is going to become an issue,” Marple said. James Myall, an economist and policy analyst with the Maine Center for Economic Policy, said Maine lawmakers are going to have to grapple with significant issues if Maine is to return to more robust growth. He said a shift from a manufacturing economy to one more focused on services means that some Maine workers’ skills don’t line up with what’s needed in the job market. So the state might want to consider expanding job training programs, he said. Myall and others noted that swings in state GDPs are typically more extreme in smaller states, like Maine. And there are factors that are absent from or less significant in other states, such as bad weather dampening economic output in the winter, Myall said. But, like Marple, he said the pair of underlying factors inhibiting workforce expansion – a population that’s both older and barely growing – are likely to keep a lid on the state’s economy. “I don’t think we’re going to see robust growth,” especially in the short term, he said. State officials echoed many of the thoughts of the private economists. 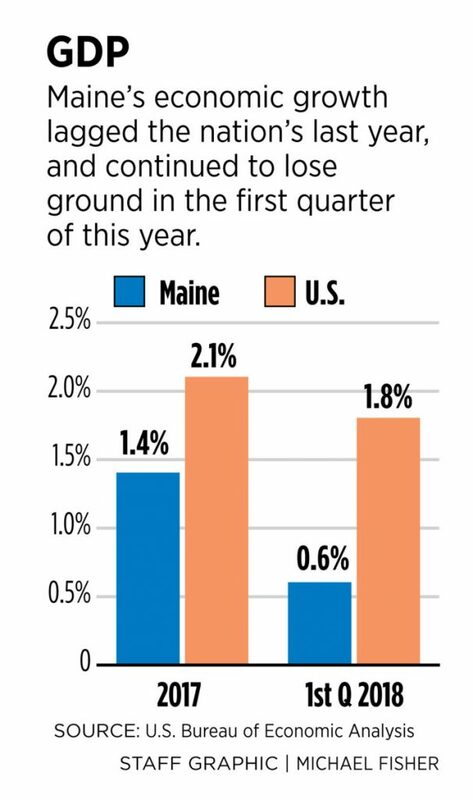 In a statement, the Maine Department of Labor noted that GDP figures for small states like Maine are often more volatile than for larger states or the country as a whole. And the older, slow-growing population was noted. Utah’s economy grew 3.2 percent in the first three months of the year, the second-highest rate in the country. Washington state, with a growth rate of 3.6 percent in the quarter, was the fastest-growing state in the U.S.
LePage’s office said in a statement that a referendum-adopted increase in minimum wages is responsible, at least in part, for the lackluster economy. The ballot measure, approved in 2016, will eventually raise the minimum hourly wage to $12 by 2020. “The governor also believes that, in addition to our imbalanced age structure, the artificial increase on wages and salaries caused by the rise (mandated) in the minimum wage referendum – specifically the wage compression it creates – will continue to further constrain Maine’s growth,” the statement said.